ChaiMate is an all natural alternative to artifcial energy drinks. Thanks to its high caffeine content and fresh orange taste, ChaiMate wakes up your body and mind at any time of the day! 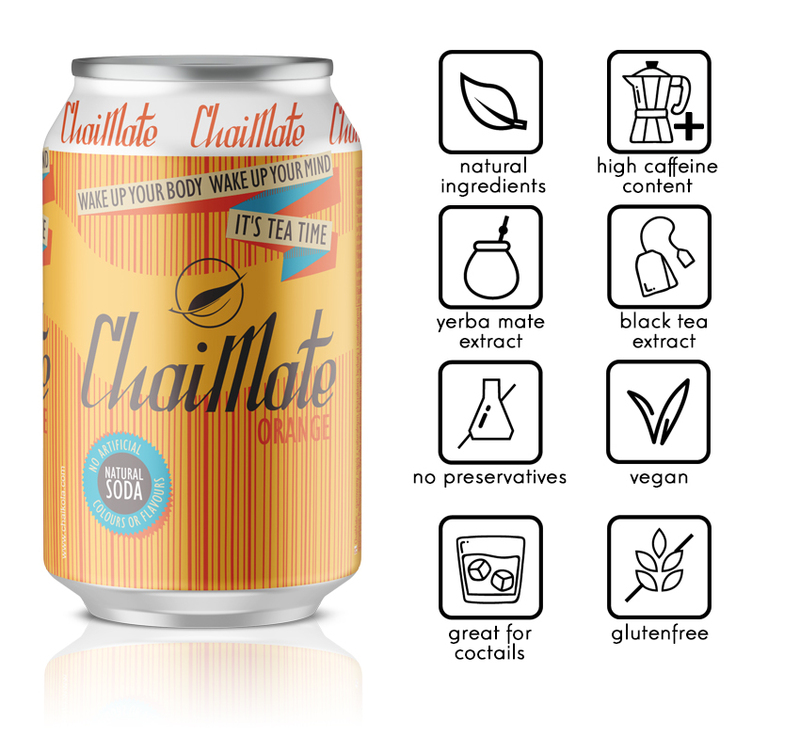 ChaiMate combines black tea (Chai), energetic yerba mate (Mate) and fresh sunny taste of orange. ChaiMate is a natural energetic bomb – it contains a big amount of caffeine: 30 mg/100 ml. Unlike most of energy drinks, ChaiMate does not contain harmful ingredients. ChaiMate is all natural, vegan and gluten free. The color of ChaiMate comes from the natural color of plant extracts and not from articficial colorants. ChaiMate is a great beverage for all who want to wake up and who seek good and natural products. Those who read product labels will understand our label entirely – no suspicious elements included! Water, sugar, carbon dioxide, yerba mate extract, black tea extract, accidity regulator: citric acid, natural flavors, caffeine (30 mg/100 ml). Contains no preservatives. Pasteurized. Do you like fancy exotic flavors with a strong caffeine kick? If your answer is YES, just be sure to try Tropical Chai. 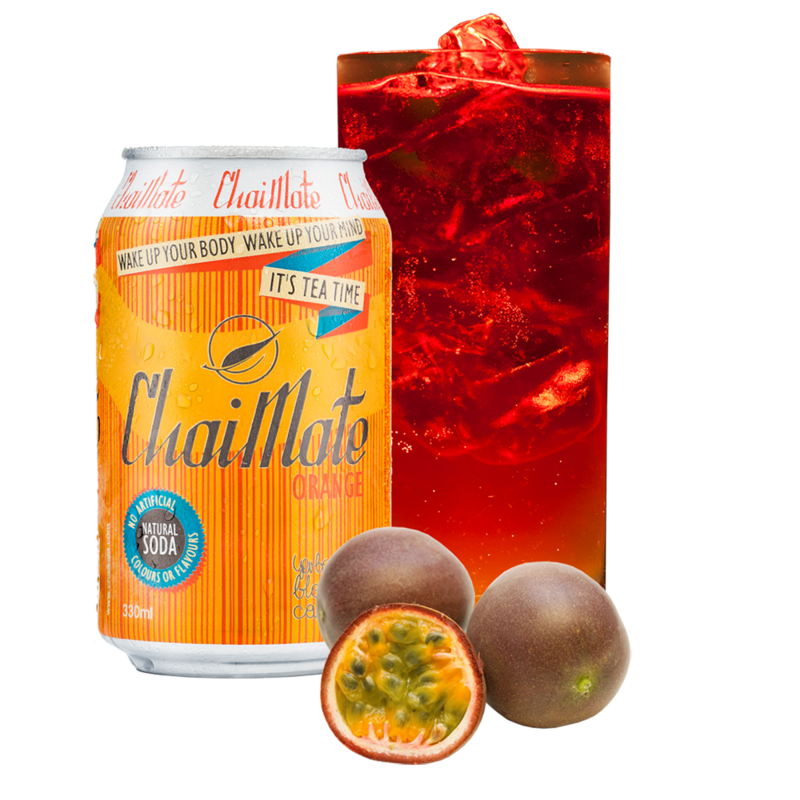 The orange flavor of ChaiMate fits perfectly with passion fruit and slightly dry taste of cranberry vodka. Watch out, because ChaiMate cocktails have a really good kick. Caffeine is a central nervous system stimulant from the methylxanthine class. It is the world’s most widely consumed psychoactive drug. Unlike many other psychoactive substances, it is legal and unregulated in nearly all parts of the world. It is found in seeds, nuts and leaves of numerous plants across South America and East Asia. Orange is the fruit of a citrus species called Citrus sinensis from the Rutaceae family. It is also called sweet orange to distinguish it from its bitter relative Citrus aurantium. Precisely, orange is a hybrid between pomelo (Citrus maxima) and mandarin (Citrus reticulata). It contains around 25% pomelo and 75% mandarin genes.